Recently, through a friend at work I came to talk to a gentleman called ‘Ray Matthews’. 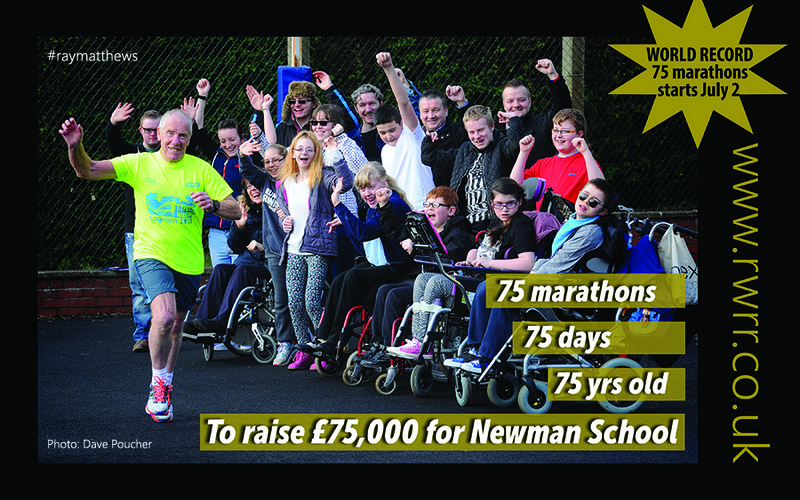 Shauna explained about this incredible, humble gentleman who was going to try and raise £75,000 for the children at Newman School in Rotherham who desperately need a soft playground so they can play safely with their varying physical disabilities. 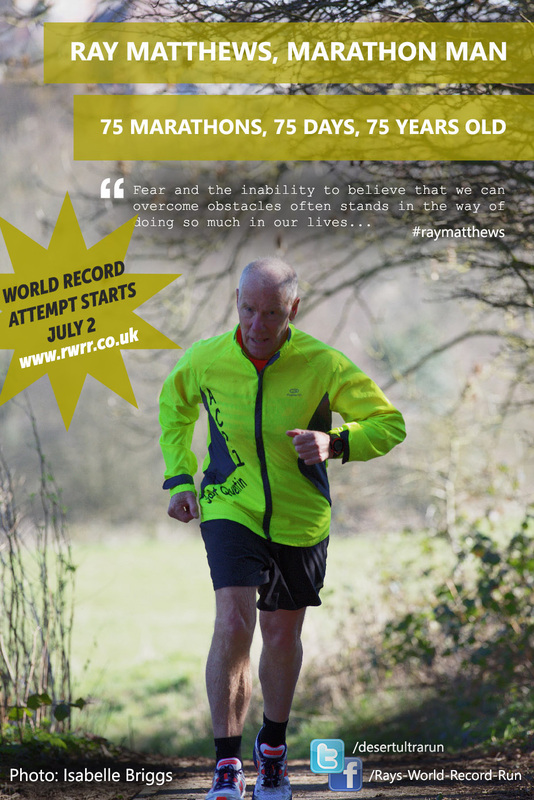 I thought this admirable but when she then told me….. “He’s going to run 75 Marathons in 75 Days and he’s 75 years old…a new world record” I thought she was having a laugh. Could this even be possible? EVER? And then I spoke to Ray on the phone and he started to tell me his story. Immediately I went and bought his two books, the KINDLE editions so I could read about how someone gets to achieve great feats on endurance (and believe me he has..). I volunteered to help out a little by doing some updates on social media and just passing the word around because I figured that PEOPLE NEED TO KNOW ABOUT THIS and of course I wanted to see him raise that money for the school. BTW the fundraising page is at www.donateplayground.uk if you wanted to throw a few pounds his way for the school. Think about it for a moment, 75 Marathons in 75 Days and he’s 75 Years Old. And he’s lovely, he’s humble, he’s inspiring and he tells a great story. PLEASE SHARE! LET EVERYONE KNOW! The key to long term success is perseverance and endurance and one is more likely to get to the end and finish if challenges are taken at a steady pace. It REALLY is OK to plod along and enjoy the scenery. The last three weeks I’m kinda stuck in the low 250’s. Normally this would have previously been enough for me to throw my hands up in exasperation and head down to the shop on the corner to buy 2 giant bars of Cadbury’s Milk Chocolate and a large bag of chips. That’s not something I’ve done for 5 or 6 months now. And that is how I’m facing my latest challenge, my second Marathon. The Plusnet Yorkshire Marathon takes place on October 9th in the City of York. Two work colleagues and I will be running for my employer http://www.pmsdiecasting.co.uk to raise money for our chosen charity for 2016 which is the ‘Children’s Hospital Charity’. We’ll be running as part of ‘Team Theo’. Will I come last again? Probably… but I’ll finish. I won’t give up. PS: Did my first in public 5k run last week for Cancer Research as part of the #pinkarmy. I walked and jogged it in just under 42 minutes. 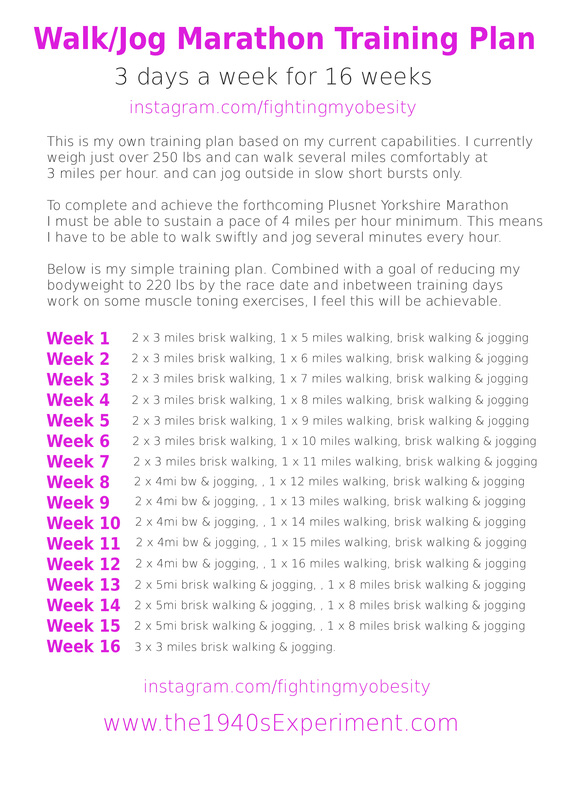 Here’s my MARATHON training plan if you are interested. Click on it to print.